After a few very busy days in Marrakech, visiting our suppliers to seek out more hidden gems to add to our Mint Morocco collection, we thought we would treat ourselves to a little relaxation, and experience one of the new ‘Express Cookery Workshops’ now available at Marrakech’s top Cookery School, the legendary La Maison Arabe. 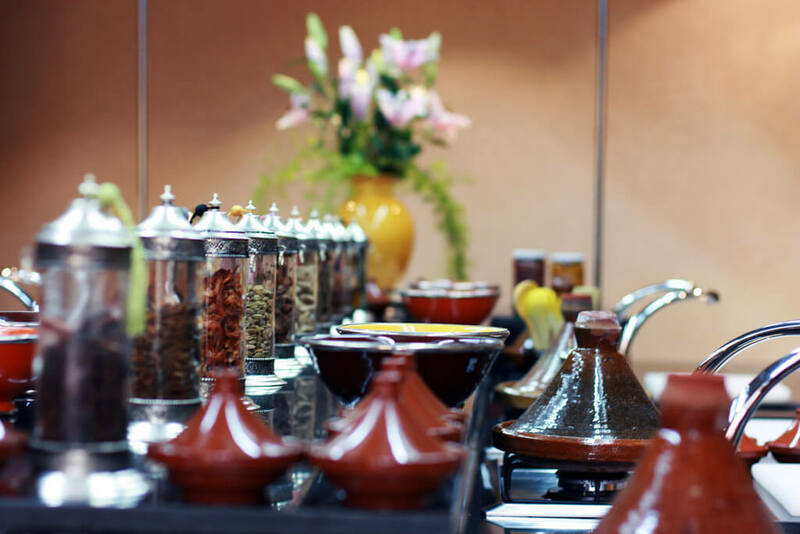 We had always been under the impression that the art of Moroccan cookery, in particular, the tasty tajines, was to cook them slowly at a very low heat. Little did we know that we could rustle up a delicious, authentic Moroccan meal in just under an hour! Today’s dish to be prepared was a tasty chicken tajine with caramelised apricots, which we would then eat for our lunch! We simply had to replicate our dada’s (a traditional Moroccan female chef) every move, with a little help from our friendly translator. After introductions were made, we were given our apron and recipe card, then shown to our individual (and rather smart!) workstations. Towards the end of our class, we given a quick lesson on how to make tradition Moroccan tea, but unlike the usual mint tea, we were expertly shown how to prepare saffron tea, which was absolutely delicious! Saffron grows in abundance in Morocco and is significantly cheaper than at home. We quickly added this new ingredient to our ‘souk’ shopping list…where we were planning to delve into after lunch. Before we knew it, our time was up! We then sat down to sample our express tajine in the pretty, shaded courtyard. Even if we say so ourselves, our results were pretty impressive! We enjoyed our experience so much that we decided to treat ourselves to a copy of La Maison Arabe’s ‘One hour’ recipe book at their lovely boutique, so we can continue learning all about this fascinating cuisine when we get home. La Maison Arabe’s impressive new Cookery School caters for groups of all sizes, with work stations to suit individuals and small groups, as well as a separate spacious kitchen for up to 26 students! Cookery classes are also available for up to 16 people at La Maison Arabe’s secret garden, a beautiful oasis just a short drive from the hotel.